Classic Style Home: My Biggest Project Ever! Sorry, for the one post last week. I needed a vacation from my vacation, lol. It was also the last week of school for my boys. You moms know how crazy that can be with all of the end of year activities going on. But, that's not all that happened last week. We also signed a contract to put in a swimming pool! The entire family is so excited. I'm hoping that it will be completed by July 4th, but that will only happen if it doesn't rain the entire month. Realistically, it will probably be mid-July, but that's just in time for my son's 11th birthday. I'll take a pool party over a paintball party any day! There are some major decisions to make this week about the design. My husband and I have some very different ideas so it's been...challenging. We have agreed on a free form pool instead of a rectangular one due to the size constraints of our backyard. The decking is going to be a stamped concrete, but we have no idea what pattern or color. Thankfully, we get to see samples soon. The coping around the pool will be flagstone. 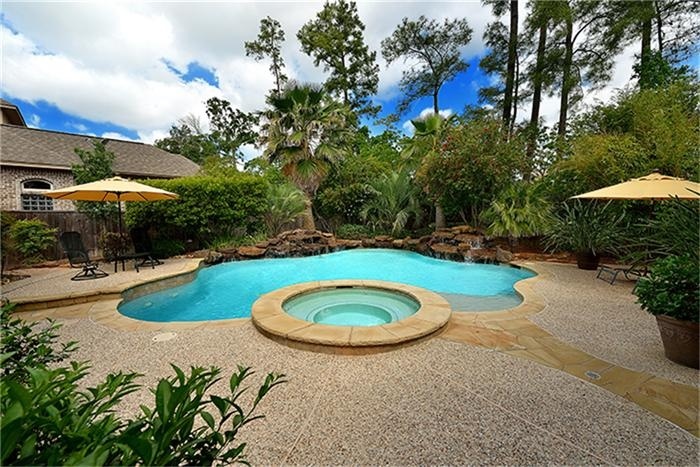 What we're trying to decide on right now is whether to go with rock waterfalls or a stacked stone wall behind the pool. The stone wall also has waterfalls, but just not as dramatically as the rocks. Here are a few pools in our town to give you an idea of what it will look like. Or, maybe a little wall with a rock waterfall. I like the stacked stone...we mixed the stacked stone and rocks together in our back yard around the pool...it came out great! I like the waterfall…it looks so natural. But, which ever you chose, you can't go wrong! I love the photo of the last pool. I can't wait! That's so exciting! I love all the inspiration pictures, but I kind of like the one with both types, the last one. We're in the Home Stretch!